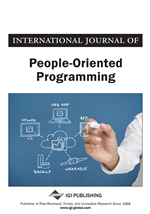 People Oriented Programming (POP) is a new paradigm for developing individual-oriented software applications and associated devices that entails four defining elements. The first three elements call upon, respectively, the individual user: 1. As the central focus of a customised software artefact addressing their heterogeneous needs, described as ‘markets of one'. 2. As a self-ethnographer administering and using Cultural Probes, sensors, personal Role Models and Scenarios to gather their own data and requirements. 3. As end-user developers, coming up with their own solutions to match their personal needs, utilising user-friendly computer languages, development environments and software toolkits designed to make the user the centre of innovation in new product development. The fourth defining element of POP is the cognitive and emotion-led modelling behind the tools, techniques and frameworks upon which the user toolkits are built. The models are drawn from two perspectives that rely on Psychology: the Agent-Oriented paradigm and its connection with Cognitive Task Modelling; and from Emotion-led Modelling for requirements gathering. POP draws upon research from the analysis, design and development paradigms of software development, software engineering and from within HCI (Human Computer Interaction) including Task Analysis. Many user-friendly tools and coding environments exist that can service POP developers. However further research is needed to provide a broad selection of tools to cater for everybody interested. After defining the four elements of POP this paper concentrates on cognitive and emotion-led modelling of people's activities, examining meta-models drawn from Task Analysis and the Agent-Oriented paradigm. The meta-models are of interest in the service of the third element: to be used as foundational structures in building new, highly usable and well-engineered development tools for end-users to code or configure solutions that service their own needs. The ShaMAN meta-model is described and presented as a potential foundational structure. • Immersion of the user within multiple parallel social worlds including personal, family, recreational and work-related social groupings. The People-Oriented Programming paradigm was born of the need to address this multifaceted design and development problem. It has a particular strength over conventional paradigms within domestic and non-work settings, where people spend a significant amount of their time, often on non-work related tasks, goals and less results-orientated activities.